Adenine is one of the two purine nucleobases used in forming nucleotides of the nucleic acids DNA and RNA. "Nucleobases" are the parts of RNA and DNA that are involved in pairing up, while "nucleotides" are chemical compounds that consist of a heterocyclic base, a sugar, and one or more phosphate groups. 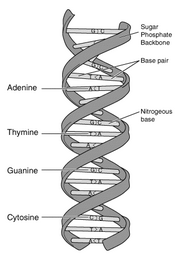 In DNA, the structure of adenine (A) allows it to bind to thymine (T) via two hydrogen bonds to assist in stabilizing the nucleic acid structures and the formation of the double helix. In RNA, adenine binds to uracil (U). Adenine and thymine, together with cytosine and guanine, the two pyrimidine nucleobases, are the four “letters” that code for cellular synthesis of amino acids, the building blocks of proteins. Simply put, there are five major bases found in the DNA and RNA in cells. The derivatives of purine are called adenine (A) and guanine (G). The other three bases—thymine (T), cytosine (C), and uracil(U)—are derivatives of pyrimidine. Purines, from which adenine is derived, are found in plants and animals. Foods high in purines include organs such as liver, brains, and kidneys, and fish such as anchovies, herring, and mackerel. The structure of adenine is critical, in that having only two sites for hydrogen bonding, it binds only to thymine (and uracil in RNA), while cytosine, which has three sites for hydrogen bonding, binds only to guanine. These four "code letters" allow cells to store their blueprint about how that life form is built. The manner in which these hydrogen bonds hold the strands of the nucleic acid together to form the double helix, yet allow the strands to "unzip" for replication and transcription, is remarkable from a design point of view. All cells of all living organisms, no matter how simple or complex, share this design. In the human body, adenine is synthesized in the liver. Biological systems tend to conserve energy, so usually adenine is obtained through the diet, the body degrading nucleic acid chains to obtain individual bases and reconstructing them through mitosis. The vitamin folic acid is essential for adenine synthesis. Adenine forms adenosine, a nucleoside, when attached to ribose, and deoxyadenosine when attached to deoxyribose; it forms adenosine triphosphate (ATP), a nucleotide, when three phosphate groups are added to adenosine. Adenosine triphosphate is used in cellular metabolism as one of the basic methods of transferring chemical energy between reactions. In older literature, adenine was sometimes called Vitamin B4. However it is no longer considered a true vitamin (see Vitamin B). Some think that, at the origin of life on Earth, the first adenine was formed by the polymerizing of five hydrogen cyanide (HCN) molecules. This page was last modified on 1 February 2019, at 20:50.